What is a traditional tale? Traditional tales like Cinderella, Little Red Riding Hood and Goldilocks play an important part in early literacy. We explain how these well-known stories are used to help develop reading comprehension and early writing skills, and explain how you can help your child's learning with fairy tales at home. A traditional tale is a story that has been told and re-told for many years, and consequently, becomes a story that almost everyone knows. Traditional tales are also referred to as fairy stories or fairy tales. Stories such as Cinderella, Goldilocks and the Three Bears and Jack and the Beanstalk are all traditional stories. How do traditional tales and fables differ? A fable is a story that features animals, plants or forces of nature and ends with a ‘moral’. In both Key Stages 1 and 2, teachers will often use a traditional story as a way of teaching children the conventions of story-writing. In Key Stage 1, a teacher would read children various traditional tales and discuss the structure in terms of beginning, middle and end. They might map out the structure on the board to make this clear to the children; for example, they might show three boxes (organised horizontally or vertically) and then write a short sentence in each to show what happens in the beginning, middle and end of the story. 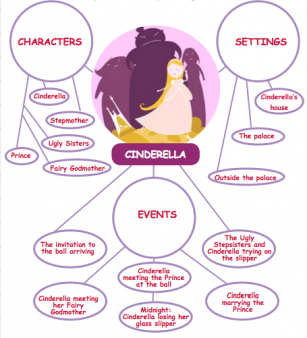 Over time the children might progress to analysing the story structure by using a story map or a spider diagram. To bring the story alive to the children, teachers might ask them to carry out various drama activities, such as acting out the story with puppets or ‘hot-seating’ (where one person sits on a chair pretending to be a character from a story and other children in the class ask them questions). They might introduce the story to children in different forms, for example: watching a film or television adaptation or reading a play script. Children would then be asked to re-tell the story orally, using picture or note prompts. Finally, they would be asked to re-write the story in their own words. In Key Stage 2 teachers would be less likely to use puppets and picture prompts, but would follow a similar teaching sequence, with plenty of opportunities for drama and story re-telling. Traditional tales might also be used to help children reflect on more advanced writing techniques, such as point of view (lots of fairy tales read completely differently when written from a different point of view; look at Honestly, Red Riding Hood was Rotten! : The Story of Little Red Riding Hood as Told by the Wolf) or the difference between fact and opinion. The video below would make an excellent starting point for a discussion with a KS2 child! Ask them plenty of questions about the characters to help develop their reading comprehension, including questions where retrieval of information is required (‘What did Cinderella leave behind at the ball?’) as well as questions that rely on inference (‘How can you tell that the ugly sisters don’t like Cinderella?’) and also questions that rely on deduction (‘How do you think Cinderella feels about being left at home?’). All of this exploration of characters’ feelings helps children to think more deeply about the characters that they write about, so can really help them with their writing as well as their reading comprehension. Dog comes to the rescue when fairy-tale characters need help in this lovely, beautifully illustrated story. Use this spiral-bound book to create your own crazy mash-up of traditional tales. Giggles are guaranteed with this super-silly collection of fairy tale retellings, complete with comic illustrations. The first in an extensive series featuring traditional tale characters children know and love. A traditional tale told in inimitable Lauren Child style. A picture book to pore over for hours! One of a series of classic fairy tales from the Brothers Grimm, retold for KS1 children to read by themselves. A very different, very funny take on the tale of the three little pigs, told from the (unfortunate?) wolf's point of view. A lyrical, engaging version of the classic story, with detailed, beautiful illustrations to examine. A fantastic retelling of Little Red Riding Hood with a warmer, wilder setting. Fifteen lavishly illustrated tales, including Hansel and Gretel, Rumpelstiltskin, Tom Thumb and The Frog Prince. A visually striking, abriged version of Oscar Wilde's timeless fairy tale, first published in 1888. Outgrown traditional tales? Rediscover them with a fresh and funny modern spin on the classic stories, perfect for kids aged 8+. Find out how selfish Lion got his comeuppance, go to a Frog wedding in the Sky Kingdom and more in a collection of stories drawn from the rich folklore of many countries throughout Africa, and brought to life with humour and rhyme. A collection of Indian folklore stories featuring wicked magicians, wise old priests, charming princes and beautiful princesses, greedy tigers and wily jackals; these magical tales from India's Moghul period are full of adventure and trickery. A collection of tales gathered from the many different islands of the Caribbean. From the very first Kingfisher to Anansi the Spider Man, these lively retellings are full of humour and beautifully retold by Trish Cooke.